Маркучи за въздух Съдържа 3 продукта. You have chosen the right compressor and the pneumatic tool for them, but something is missing? 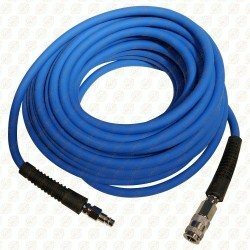 It is the air hose, which you can connect these with. Fortunately we offer many types also, based on size, and pressure. 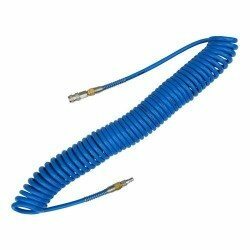 You can choose the right one from our spiral or straight hoses. 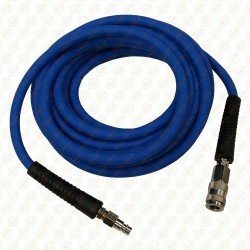 If you take advice, choose long hoses for work in large places, for example for paint sprayers, and shorter for work where you don’t need to move a lot with the pneumatic tool. Спирален въздушен маркуч - 12 м, 8x12mm, с бързи връзки 1/4"
Does not kink and is more resistant due to the flexible, reinforced PVC material. Supplied with a quick coupler. Operating pressure 20bar. Does not kink and is more resistant due to the flexible, reinforced PVC material. Supplied with a standard quick coupler and a connector piece. Operating pressure 20bar.